Active all his life, Noyce enjoyed reading Hemingway, flying his own airplane, hang gliding, and scuba diving. Noyce believed that microelectronics would continue to advance in complexity and sophistication well beyond its current state, leading to the question of what use society would make of the technology. In his last interview, Noyce was asked what he would do if he were "emperor" of the United States. He said that he would, among other things, "…make sure we are preparing our next generation to flourish in a high-tech age. And that means education of the lowest and the poorest, as well as at the graduate school level." Noyce was born on December 12, 1927, in Burlington, Iowa as the third of four sons of the Rev. Ralph Brewster Noyce. His father had graduated from Doane College (1915), Oberlin College (1920), and the Chicago Theological Seminary (1923). He was also nominated for a Rhodes Scholarship. The Reverend Noyce worked as a Congregational clergyman and as the associate superintendent of the Iowa Conference of Congregational Churches in the 1930s and 1940s. His mother, Harriet May Norton, was the daughter of the Rev. Milton J. Norton, a Congregational clergyman, and of Louise Hill. She graduated from Oberlin College in 1921 and had dreamed of becoming a missionary prior to her marriage. She has been described as an intelligent woman with a commanding will. Bob Noyce had three siblings: Donald Sterling Noyce, Gaylord Brewster Noyce and Ralph Harold Noyce. His earliest childhood memory involved beating his father at ping pong and feeling absolutely shocked when his mother reacted to the thrilling news of his victory with a distracted "Wasn't that nice of Daddy to let you win?" Even at the age of five, Noyce felt offended by the notion of intentionally losing at anything. "That's not the game", he sulked to his mother. "If you're going to play, play to win!" In the summer of 1940, at the age of 12, he built a boy-sized aircraft with his brother, which they used to fly from the roof of the Grinnell College stables. Later he built a radio from scratch and motorized his sled by welding a propeller and an engine from an old washing machine to the back of it. His parents were both religious but Noyce became an agnostic and irreligious in later life. He grew up in Grinnell, Iowa, and attended the local schools. He exhibited a talent for mathematics and science while in high school and took the Grinnell College freshman physics course in his senior year. He graduated from Grinnell High School in 1945 and entered Grinnell College in the fall of that year. He was the star diver on the 1947 Midwest Conference Championship swim team. While at Grinnell College, Noyce sang, played the oboe and acted. In Noyce’s junior year, he got in trouble for stealing a 25-pound pig from the mayor of Grinnell’s farm and roasting it at a school luau. The mayor sent a letter home to Noyce’s parents stating that “In the agricultural state of Iowa, stealing a domestic animal is a felony which carries a minimum penalty of a year in prison and a fine of one thousand dollars.” So essentially, Noyce would have to be expelled from Grinnell College. Grant Gale, Noyce’s physics professor and the President of Grinnell College, did not want to lose a student like Robert who had so much potential. They were able to compromise with the mayor so that the college would compensate him for the pig, Noyce would only be suspended for one semester, and no further charges would be pressed. He returned to Grinnell in February 1949. He graduated Phi Beta Kappa with a BA in physics and mathematics from Grinnell College in 1949. He also received a signal honor from his classmates: the Brown Derby Prize, which recognized "the senior man who earned the best grades with the least amount of work". While an undergraduate, Noyce attended a physics course of the professor Grant Gale and was fascinated by the physics. Gale got hold of two of the very first transistors ever to come out of Bell Labs and showed them off to his class and Noyce was hooked. Grant Gale suggested that he apply to the doctoral program in physics at MIT, which he did. Noyce had a mind so quick that his graduate school friends called him "Rapid Robert." He received his doctorate in physics from Massachusetts Institute of Technology in 1953. 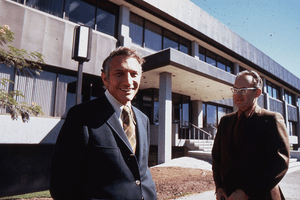 Robert Noyce and Gordon Moore in front of the Intel SC1 building in Santa Clara in 1970. After graduating from the Massachusetts Institute of Technology in 1953, he took his first job as a research engineer at the Philco Corporation in Philadelphia. He left in 1956 for the Shockley Semiconductor Laboratory in Mountain View, California. He joined William Shockley, a co-inventor of the transistor and eventual Nobel Prize winner, at the Shockley Semiconductor Laboratory, a division of Beckman Instruments. Noyce left with the "traitorous eight" in 1957, upon having issues with respect to the quality of its management, and co-founded the influential Fairchild Semiconductor corporation. According to Sherman Fairchild, Noyce's impassioned presentation of his vision was the reason Fairchild had agreed to create the semiconductor division for the traitorous eight. Noyce and Gordon Moore founded Intel in 1968 when they left Fairchild Semiconductor. Arthur Rock, the chairman of Intel's board and a major investor in the company said that for Intel to succeed, Intel needed Noyce, Moore and Andrew Grove. And it needed them in that order. Noyce: the visionary, born to inspire; Moore: the virtuoso of technology; and Grove: the technologist turned management scientist. The relaxed culture that Noyce brought to Intel was a carry-over from his style at Fairchild Semiconductor. He treated employees as family, rewarding and encouraging teamwork. His follow-your-bliss management style set the tone for many Valley success stories. Noyce's management style could be called a "roll up your sleeves" style. He shunned fancy corporate cars, reserved parking spaces, private jets, offices, and furnishings in favor of a less-structured, relaxed working environment in which everyone contributed and no one received lavish benefits. By declining the usual executive perks he stood as a model for future generations of Intel CEOs. At Intel, he oversaw Ted Hoff's invention of the microprocessor, which was his second revolution. In 1953, Noyce married Elizabeth Bottomley. She was a 1951 graduate of Tufts University. During this time, the couple lived in Los Altos, California. They had four children: William B., Pendred, Priscilla, and Margaret. Elizabeth loved New England, so the family acquired a 50-acre coastal summer home in Bremen, Maine. Elizabeth and the children would summer there. Robert would visit during the summer, but he continued working at Intel during the summer. The couple divorced in 1974. On November 27, 1974, Noyce married Ann Schmeltz Bowers. Bowers, a 1959 graduate of Cornell University, also received an honorary Ph.D. from Santa Clara University, where she was a trustee for nearly 20 years. She was the first Director of Personnel for Intel Corporation and the first Vice President of Human Resources for Apple Inc. She currently serves as Chair of the Board and the founding trustee of the Noyce Foundation. Noyce suffered a heart attack at age 62 at home on June 3, 1990, and later died at the Seton Medical Center in Austin, Texas. In July 1959, he filed for U.S. Patent 2,981,877 "Semiconductor Device and Lead Structure", a type of integrated circuit. This independent effort was recorded only a few months after the key findings of inventor Jack Kilby. For his co-invention of the integrated circuit and its world-transforming impact, three presidents of the United States honored him. Noyce was a holder of many honors and awards. President Ronald Reagan awarded him the National Medal of Technology in 1987. Two years later, he was inducted into the U.S. Business Hall of Fame sponsored by Junior Achievement, during a black tie ceremony keynoted by President George H. W. Bush. In 1990 Noyce – along with, among others, Jack Kilby and transistor inventor John Bardeen – received a "Lifetime Achievement Medal" during the bicentennial celebration of the Patent Act. Noyce received the Franklin Institute's Stuart Ballantine Medal in 1966. He was awarded the IEEE Medal of Honor in 1978 "for his contributions to the silicon integrated circuit, a cornerstone of modern electronics." In 1979, he was awarded the National Medal of Science. Noyce was elected a Fellow of the American Academy of Arts and Sciences in 1980. The National Academy of Engineering awarded him its 1989 Charles Stark Draper Prize. The science building at his alma mater, Grinnell College, is named after him. On December 12, 2011, Noyce was honored with a Google Doodle celebrating the 84th anniversary of his birth. The Noyce Foundation was founded in 1990 by his family. The foundation is dedicated to improving public education in mathematics and science in grades K-12. The foundation announced that it would end operations in 2015. Noyce was granted 15 patents. U.S. Patent 3,108,359 Method for fabricating transistors, filed June 1959, issued October 1963, assigned to Fairchild Camera and Instrument Corp.
U.S. Patent 3,150,299 Semiconductor circuit complex having isolation means, filed September 1959, issued September 1964, assigned to Fairchild Camera and Instrument Corp.
U.S. Patent 3,183,129 Method of forming a semiconductor, filed July 1963, issued May 1965, assigned to Fairchild Camera and Instrument Corp.
U.S. Patent 3,199,002 Solid state circuit with crossing leads, filed April 1961, issued August 1965, assigned to Fairchild Camera and Instrument Corp.
U.S. Patent 3,325,787 Trainable system, filed October 1964, issued June 1967, assigned to Fairchild Camera and Instrument Corp.
↑ While Kilby's invention was six months earlier, neither man rejected the title of co-inventor. 1 2 3 Wolfe, Tom (December 1983). "The Tinkerings of Robert Noyce". Esquire Magazine: 346–74. Retrieved 2010-05-07. ↑ Leslie Berlin (2005). The Man Behind The Microchip: Robert Noyce And The Invention Of Silicon Valley. Oxford University Press. p. 235. ISBN 9780195163438. The minister, who had hidden himself in a closet, stepped forward to marry the couple in a ceremony from which Bowers had excised every reference to God. "Bob agreed to that. Neither of us could decide about God," Bowers says. "I remember Bob saying, 'Some people who believe in God are good, and some people who believe in God are not good. So where does that leave you?' He had [also] looked around and decided that religion is responsible for a lot of trouble in the world." Noyce, always pushing against the limits of accepted knowledge, told Bowers that what bothered him most about organized religions was that "people don't think in churches." ↑ Berlin, Leslie. "Adrenaline and Gasoline." The Man behind the Microchip: Robert Noyce and the Invention of Silicon Valley. Oxford: Oxford UP, 2005. 22-23. Print. ↑ One-time Intel CEO Andy Grove on the other hand, believed in maximizing the productivity of his employees, and he and the company became known for his guiding motto: "Only the paranoid survive". He was notorious for his directness in finding fault and would question his colleagues so intensely as occasionally to border on intimidation. ↑ Garten, Jeffrey E. (April 11, 2005). "Andy Grove Made The Elephant Dance". Business Week. Retrieved 2010-05-07. ↑ "Elizabeth B. Noyce, 65, Benefactor of Maine With Vast Settlement From Her Divorce". The New York Times. September 20, 1996. Retrieved April 10, 2010. ↑ Berlin, Leslie (2005). The Man behind the Microchip: Robert Noyce and the Invention of Silicon Valley. Oxford University Press. ISBN 0-19-516343-5. , pp. ↑ "Class notes 1950-1959". Cornell Alumni Magazine. Sep–Oct 2007. Retrieved 2012-01-04. 1 2 "Noyce Foundation: About Us". Retrieved 2 January 2012. ↑ Hays, Constance L. (June 4, 1990). "An Inventor of the Microchip, Robert N. Noyce, Dies at 62". The New York Times. Retrieved April 10, 2010. ↑ "The National Medal of Technology and Innovation Recipients - 1987". United States Patent and Trademark Office. Retrieved January 4, 2012. ↑ "U.S. Business Hall of Fame - Robert N. Noyce". Junior Achievement. Retrieved January 4, 2012. ↑ "President Bush to honor Noyce and other laureates at U.S. Business Hall of Fame induction ceremony tonight in Colorado Springs". PR Newswire. March 16, 1989. Retrieved January 4, 2012. ↑ "Franklin Laureate Database - Stuart Ballantine Medal 1966 Laureates". Franklin Institute. Retrieved December 6, 2011. ↑ "IEEE Medal of Honor Recipients" (PDF). IEEE. Retrieved December 6, 2011. ↑ "Robert Noyce". IEEE Global History Network. IEEE. Retrieved July 18, 2011. ↑ "Book of Members, 1780-2010: Chapter N" (PDF). American Academy of Arts and Sciences. Retrieved April 20, 2011. ↑ "Recipients of The Charles Stark Draper Prize". National Academy of Engineering. Retrieved December 6, 2011. ↑ "Robert Noyce Google Doodle: Logo conducts tribute to Intel co-founder and 'mayor of Silicon Valley'". The Washington Post. December 12, 2011. Retrieved December 12, 2011. Gaylord, Mary M. Welles. Life and Labors of Rev. Reuben Gaylord Omaha: Rees Printing Company, 1889. Wolfe, Tom. The Tinkerings of Robert Noyce, How the Sun Rose on the Silicon Valley, Esquire Magazine, December 1983, pp. 346-374. Wikimedia Commons has media related to Robert Noyce. Obituary of Pro. Rev. Gaylord Brewster Noyce, brother of Robert Noyce. He is also among the seven Freedom Riders of 1961, and a friend of Martin Luther King, Jr.